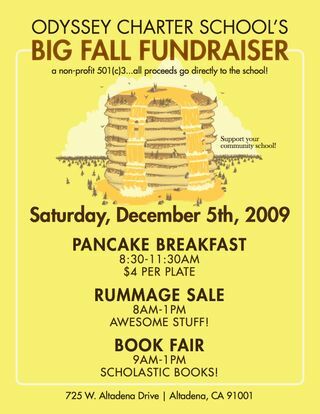 Odyssey Charter School: pancakes, rummage sale, books Sat. Odyssey Charter School, 725 W. Altadena Dr., is holding its Big Fall Fundraiser on Sat., Dec. 5, 8:30 AM-1 PM (altho' pancakes end at 11:30!) Pancake breakfast ($4), rummage sale, and Scholastic books for sale as well.